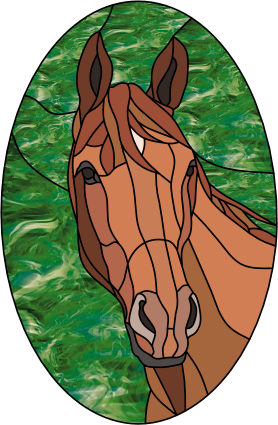 This pattern features Esperance, one of our horses. 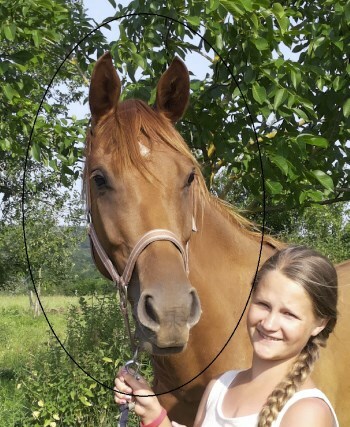 Esperance is a five-year-old KWPN horse that we as a family discovered when she was only two weeks old. Our oldest daughter (nine years old at the time) fell in love and the two bonded immediately. Because Esperance lived in the south of France, we saw her only during the holidays. Nevertheless, we decided to buy her and let her grow up with her own family in Dordogne, France. Every holiday we "worked" with her, so our daughter and Esperance grew up together. Every holiday it was more difficult to leave her, but in September she came to us at last. Twice a day we attend to her, but despite that our daughter misses her a lot during the day, so for that reason we asked Foka Glass to draw a pattern of her. And how similar! Exactly our girl. Making the window was quite a process, partly because I wanted to keep it a secret from our daughter. 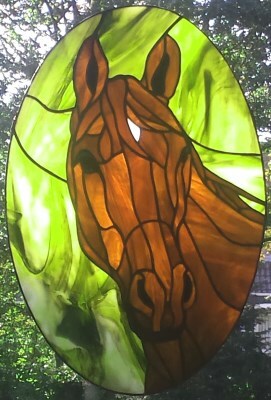 There are many small pieces, and matching the color of our horse to the glass was sometimes difficult. It finished so beautifully because it was made with lots of love. Esperance hangs in our living room so we can enjoy her any time of day. Esther wanted for many years to be a stained glass / Tiffany artist. 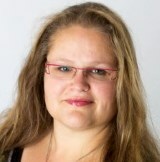 She lives in the south of the Netherlands with her husband, four kids, two dogs, five cats and two horses. For as long as she can remember she's been creative in many ways. A year ago she started a short course on Tiffany windows and that was enough for her to get addicted to this hobby. The window of Esperance was her first big project. Foka is a stained glass shop in the Netherlands providing all materials and glass for stained glass and the Tiffany technique. Foka is family-owned and celebrates its 30-year anniversary in 2015. Jodi Aben-Foolen drew the pattern of Esperance. "I love Glass Eye 2000! It gives me the opportunity to create great designs because it is so easy to make small changes during the drawing process. Details are very important. This is also why the window of Esperance could look so real."